Many parents are confused about IQ testing. The initials IQ stand for Intelligence Quotient. The term came from tests that were initially created in 1905 by Alfred Binet for the purpose of determining whether children were sufficiently intelligent to benefit from schooling. Binet devised a series of tests for each year of child development to calculate children's mental ages compared to their chrono-logical ages. He multiplied the final score by 100 to arrive at what is called the "intelligence quotient." Thus, children with IQ scores of 100 were considered of average intelligence, those with scores less than 100 were below average, and those greater than 100 were considered above average. Categories of scores were established and given names, varying from "imbecile" to "genius," and scores were used to make predictions about children's learning abilities. IQ tests have been changed and revised many times since Binet's first tests, and educators have become much more sophisticated in their use. Although the tests are often referred to as intelligence tests, educators now realize that they measure only some kinds of intelligence, and that scores are affected by cultural environments and learning as well as the individual's inherent intelligence. Despite the many limitations of IQ tests, they're still helpful when used cautiously to predict how well children will perform in various educational environments. The results also help to identify strengths and weaknesses in children's learning styles. Individual IQ tests administered by a psychologist are much more reliable than group tests, but even the latter can provide helpful information. IQ tests give reasonably effective results for children from about age four; however, scores are less reliable for preschool children than for school-age children. The only purpose for having children tested as early as age four is if parents believe their children are unusual. If children are spontaneously reading or have mastered math concepts very early, an IQ test can be used to help consider early entrance into school or appropriate educational curriculum. If children seem to be struggling with early home learning, the IQ test can help decide whether they need special preschool programs. WHAT DO IQ TESTS LOOK LIKE? 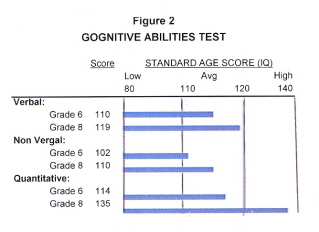 The most frequently used individual IQ tests in schools are the Wechsler Intelligence Scales. These tests are divided into ten to twelve subtests (depending on the level) that measure separate abilities. Verbal subtests measure vocabulary, arithmetic reasoning, general information, abstract reasoning, and common sense comprehension. Per-formance IQ subtests include puzzles, putting pictures into a logical series, finding what is missing in pictures, spatial reasoning with block designs, and a visual motor integration test (timed copying of codes). Results of the two groups of subtests are then summarized in separate verbal and perform-ance IQ scores as well as a full scale IQ score. Although all IQ tests require children to solve various problems, some tests result in only one total score while others provide three, five, or seven subscores. J. P. Guilford1 assumed there were 180 separate kinds of intelligence, and believed there was no total or general intelligence score. Howard Gardner's research yields seven intelligences, including linguistic, logical-mathe-matical, spatial, musical, bodily-kinesthetic, interpersonal, and intrapersonal categories2. He is developing separate tests for each. He also believes that these separate scores can not be effectively combined into one total score. ARE IQ TEST SCORES PERMANENT? Although research has shown that average IQs tend to stay fairly constant throughout people's lives, clinical experiences with elementary and secondary students indicate otherwise. Children who underachieve in school for many years often show large declines in IQ scores. 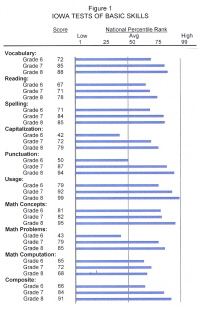 Later testing can resulthievement, both IQ test and achievement test scores often increase. Figures 1 and 2 show examples of increases in group achievement tests and IQ scores for one student. His individual IQ score also increased from 110 to 125 when he reversed his underachievement. Henry H. Goddard analyzed IQ test scores of immigrants on Ellis Island in 1912 and concluded that "test results established that 83% of the Jews, 80% of the Hungarians, 79% of the Italians, and 87% of the Russians were "feebleminded. "3 However, time has shown that the education of these immigrants dramatically improved their IQs, therefore temporarily laying to rest the naive concept of nationality differences in intelligence as measured by IQ scores. The issue of genetics versus environmental determinants of intelligence has been revived multiple times and has again received national attention in abook, The Bell Curve, by Charles Murray and Richard Herrnstein.4 The authors attempt to document by review of the research that there are inescapable racial differences in intelligence. When one regularly observes the impact of maturation on learning and IQ scores, it becomes difficult to believe that the racial differences described in The Bell Curve are actually caused by genetic limitation. Clinical experience with improving children's IQ and achievement should inspire parents to provide the best motivational and learning environments for their children. Figures 1 and 2 show how IQ and achievement scores improved for one student after his underachievement pattern was reversed at Family Achievement Clinic. Regardless of genetic or racial origin, environment and learning assuredly make a significant impact. Children who are intellectually gifted may benefit from early entrance to kindergarten, special curriculum planning within kindergarten, or a uniquely enriched preschool environment, and early testing may confirm the need for such special programming. Test scores give quantitative data, which parents may or may not choose to share with the school when communicating about their child’s special needs. The quantitative data is normative and permits parents to compare their child’s intellectual development to that of a sample of average children in similar age. Test scores often communicate more efficiently and convincingly to educators than parent observations. Weak areas that may be masked by children’s intellectual giftedness may be discovered by testing. Specifically, small muscle coordination and perceptual skills are less easily identified by observation. Preschool testing permits parents to assist children in learning and practicing these skills that could result in future problems. Test scores give parents either confidence in their personal observations or the opportunity to correct their expectations appropriately. Test scores can prevent parents from placing too much pressure on children. Hopefully, the scores will not cause parents to lose confidence in their children if the scores are not as high as expected. Early test scores provide baseline information for monitoring children’s intellectual growth and progress. 1J. P. Guilford, The Nature of Human Intelligence. New York: McGraw-Hill, 1967. 2Howard Gardner, Frames of Mind: The Theory of Multiple Intelligences, New York: Basic Books, 1983. 3Henry H. Goddard, The Binet Tests in Relation to Immigration, Journal of Psycho-Asthenics 1913, 18, pp. 105-107. 4Charles Murray & Richard Herrnstein, The Bell Curve: Intelligence and Class Structure in American Life, New York: Free Press, Div. of MacMillan Co., 1994.